From the Scottish highlands to the North Carolina mountains, through their long ancestral line of hillbilly songwriters and recording artists, runs the music that Zane and Hugh Campbell bring to their audiences. They were born into music. Their great-uncle on their mother’s side, Guy Brooks, was the first member of the family to record. Seventy-eight years ago, in 1928, he recorded for the historic Gennett label with his band, The Red Fox Chasers. He is credited with having written, in 1929, the first trucker song, “Wreck on the Mountain Road,” which is also considered country music’s first car-wreck song. On their father’s side is their aunt Ola Belle Campbell Reed, their father’s sister, who is well known in old-time and bluegrass circles. One of her songs, “High on a Mountain,” a modern bluegrass classic, has been recorded dozens of times and was a Top 20 Billboard country hit single for Marty Stuart in 1992. Ola Belle was an early pioneer as a woman in the man’s world of country music, writing her own songs and performing them with her own band, flanked by her brother Alex Campbell and the New River Boys. On their first album for the famous Starday label, she wrote half of the songs, making her one of the first female singer-songwriters before the term even existed. 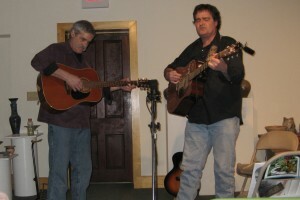 In their show, Zane and Hugh perform the songs of their ancestors, tell the stories behind the songs, and share old photographs, records, and other memorabilia pertaining to their relatives’ music. They also sing many of their own songs, some of which are about their relatives, all in a loose, country-music-style rock opera of sorts, called New River. Both Zane and Hugh have had some success of their own in the world of songwriting. Hugh’s song, “Shape of a Tear,” was recorded by The Lynn Morris Band and nominated for Song of the Year by the IBMA (International Bluegrass Music Association) in 2003. Ironically, his aunt Ola Belle was one of the nominees in 2004 for her “I’ve Endured,” recorded by Tim O’Brien. Zane is best known for having written “Post-Mortem Bar,” which in 1990 appeared in the motion picture Longtime Companion, the first American movie dealing with AIDS. With their singing, playing, and storytelling, Hugh and Zane put on a lively, fascinating show. In the colorful mountain tradition of their ancestors, they share their very personal and unique musical family history.